In EasyEDA, at the first new schematic the prefix will start as U1/R1..etc, and EasyEDA support global unique prefix at multi-sheet now. 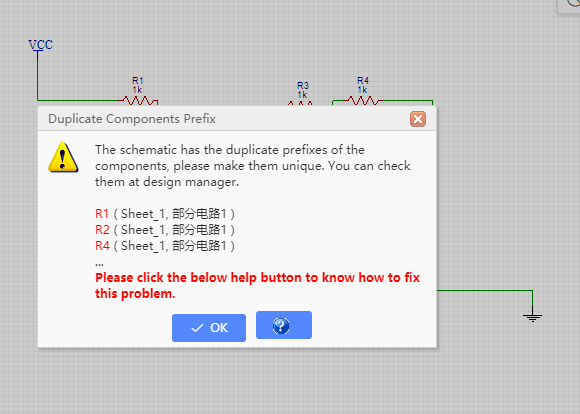 Sometimes, if you save a sheet to another project, when you convert a project to PCB, open the Design manager or run a simulation, you will get a Prefix Conflict error message. 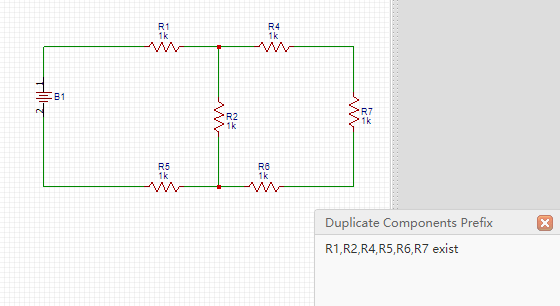 In this schematic, you will find two components with the R4 reference designator, so you just need to change one to Rx where x is a unique number in that schematic. It may be tempting to backup a schematic into the same project as the original, however, if an attempt is then made to do Convert Project to PCB, you will get the Prefix Conflict error for every component. In the above image, you can find the two identical copies of the same schematic, which when you Convert Project to PCB, EasyEDA will try to merge into a single schematic, so every item will have 2 copies. To fix this, you just have to create a backup project and remove or better still save backup copies of your schematics to that project. After creating a schematic, it is quite likely that you have component Prefixes (reference designators) that are in no particular order on the canvas. You may also have duplicates. You can automatically renumber/reset all the components’ prefix by using the Annotate function. 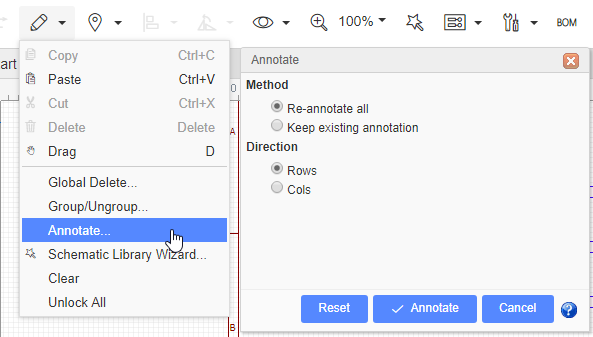 Keep existing annotation: annotates new components only (i.e. those whose reference designator finishes with ? like R? or U?). Cols annotates down the schematic in a raster pattern from top left to bottom right. Annotate: applies the selected annotation actions. Note: Annotation cannot be undone! if you do not accept the result: close all of the affected schematics without saving. If you do accept the result: make sure you save all of the affected schematics. Reset: if you want to reset all the reference designators to end with ‘?’, just click the Reset button. After that, R1 will be R?, U1 will be U? etc. Note: Reset does not reset annotation back to where it was before pressing the Annotate button.